Slot machines have a very rich history. The first slots had little in common with the ones that you now find at gambling establishments. Still the main idea of a slot game remains the same - the player must get a winning combination from the symbols on the spinning reels to get paid. Today slot games are the most popular casino amusements due to their entertainment value and simplicity. 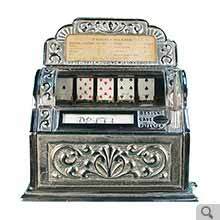 The first coin-operated gaming devices were invented in the 1880's and all they were based on the game of poker The forerunner of a modern 5-reel slot machine is the gambling machine developed by Sittman and Pitt in 1891 in Brooklyn, New York. That machine had 5 drums with a total of 50 cards based on poker. It became very popular for a short period of time and many bars in New York soon had these machines. The player had to put in a nickel, pull the lever and watch the drums spinning. The machine had no direct payout system, therefore if the player got a good poker hand, he would get a prize from the bartender such as a beer or a cigar. Early slot machines had very high "vig" (percentage or tax the house takes out of win) as the bar owners often removed two cards between 10 and Ace from the drums, usually the ten of spades and jack of hearts. 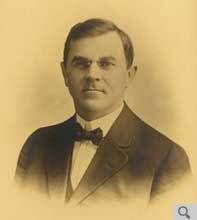 Charles Fey is known as the "Father of Slot Machines"
One-armed bandits were the invention of mechanic Charles Fey (1862-1944) from San Francisco. Charles August Fey is considered to be the "Father of Slots" and the so-called "Thomas Edison of Slot Machines" who popularized the game. He was born in Bavaria, Germany, also lived for a while in London and at last moved to San Francisco where all his ideas were brought to life. According to some historical sources, the first slot machine was invented by Fey in 1894 and the second one known as 4-11-44 - in 1895. Those machines that contained 3 spinning reels, used a lever and were known as One-armed Bandits became popular and that was the reason why Charles Fey devoted his life to developing slot machines. The Liberty Bell symbol gave the name to those slots - Liberty Bell machines. If the player had 3 Liberty Bells he would receive the highest payout of 10 nickels - jackpot. This machine was very popular and even when the devices were banned in some states, Fey still had lots of orders to complete. Fey's three-reel design of the Liberty Bell machine was so popular that it was copied by many slots manufacturers in the United States. 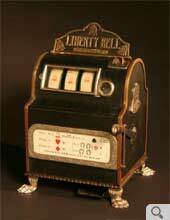 Thus in 1907, slots manufacturer Herbert Mills from Chicago produced a slot machine called the Operator Bell. By 1908 lots of "bell" machines were installed in most cigar stores, saloons, bowling alleys, houses of ill-repute and barber stores. Extra BAR symbols derived from the early logo of this company. A fruit machine paid out fruit flavored gums instead of drinks and cigars. At first, the fruit gums were paid not only for advertisement, but also as a way of avoiding anti-gambling laws in many states which said that the machines could not pay out cash rewards. 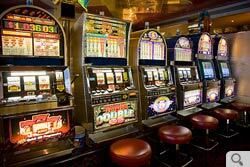 At those times all slot machines were considered to be vending machines rather than gambling devices. Now even children and women played slots which became associated with Devil devices. Thus in 1920 the Senate passed the resolution which outlawed the sale of alcohol. 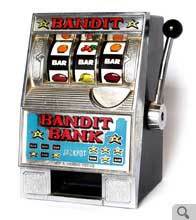 It had a great impact on gambling as most slot machines were installed in saloons. However, the closure of these establishments didn't stop the spread and growth of slots. 1919-1930's in the history of slot machine games are known as the "Golden Age of Slots" during which slot machines became widespread through the United States. Despite numerous bans and the continued war against slots they survived and were changed and improved. 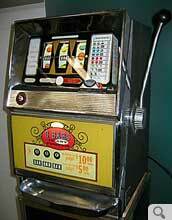 The first electromechanical slot machine was developed in 1964 and was called the Money Honey. Due to a totally new electromechanical technique, the machine paid any winnings automatically and held up to 500 coins without any attendance needed. Frankly speaking, this machine started the age of electronic games and the lever was soon used only for decoration. 1996 brought the creation of the first video slots with a second-screen bonus round called Reel'Em In by the famous American electronic gaming and amusement company WMS Industries, Inc. It is almost impossible to find a gambling hall without slot machines as they are the most popular games with the gamblers. What is more, slot machines are now installed in most bars, airports, race tracks, bowling alleys, hotels and other establishments visited by great number of people during the day. 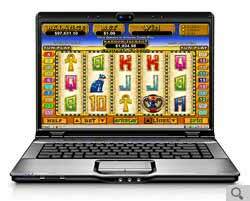 Nowadays players are lucky to play a variety of casino slots at online casinos. The beginning of online slots history is marked by the Free Trade & Processing Act passed by Antigua and Barbuda in the Caribbean in 1994. That act allowed companies from all around the world to open Internet casinos legally. Microgaming was the first software company that started developing software for online casinos. The first Internet casino Gaming Club was launched in 1995 and the second one, InterCasino, opened in 1996. The industry developed very quickly and the number of software companies and online casinos offering different games grew every year. With the aim to protect and support online players well-known Canadian Kahnawake Gaming Commission was established in 1996. Most of the players preferred to play online until the United States Senate passed Unlawful Internet Gambling Enforcement Act in 2006 which banned wire money transactions to and from casino accounts. Still many of Internet casinos accept US players. According to statistics, today slots create about 70% of the whole income of any online casino.